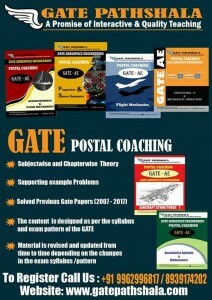 GATE Pathshala, the leading Institute for GATE, offers Postal coaching (Distance Learning Correspondence Programme) on a great demand from Engineering students. GATE Pathshala established in 2008 is the only institute which has secured 580 top All India ranks in GATE(AE) from class room and postal coaching and produced many IIScians, IITians and NITians. The Institute has developed study material with the help of subject experts in branches of Aerospace & Mechanical Engineering. The team of experts has vast experience in guiding the student community for various competitive exams. The study material being given to the students is relevant to a competitive exam. The study material is updated time to time depending on changes in the exam pattern, feed back of our beloved students and other subject experts. The study material will be sent to a student by post in 2 to 3 parcels/installments. Model Papers will be sent in appropriate time so that the student can write those exams with sufficient preparation. The study material will be sent by post after one week on receiving the application form along with the required fee. The postal coaching commenced from March 1st week onwards. Hence the students are advised to apply as soon as possible to start preparing for GATE-2019 with us. The application along with all the necessary enclosures and DD shall be sent to the following address. GATE PATHSHALA EDUCATIONAL SERVICES LLP.